It is our very sad duty to have to inform Members that John Miles passed away yesterday following complications from the effects of a stroke. He was 74 years old. 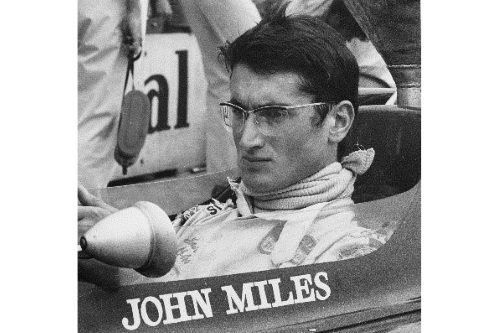 For some 10 years from 1964, John was one of the leading British drivers, initially in small capacity GT cars before moving into Formula 3, Formula 2 and ultimately Formula 1, principally with Lotus. The son of the distinguished actor Bernard Miles and his wife, the actress Josephine Wilson, who founded the celebrated Mermaid Theatre, at Puddle Dock, which was the first new theatre to be opened in the City of London since the 18th century, John’s interest in cars began at an early age although not as the result of any parental interest. His first car was an Austin 7 Nippy with which he started racing in the early ‘60s. After moving to the other end of the sports car spectrum by acquiring the Omega-Jaguar, with which he won at Debden, an airfield circuit in deepest Essex, John acquired a Diva GT10F which he assembled himself, initially with a 1-litre Ford Anglia engine, and used principally in British club racing with increasing success although he also contested the 1964 Nurburgring 1000 Ks World Sports Car Championship round, winning the 1-litre prototype class with Peter Jackson. For the following year John persuaded the prominent Willment team to employ him as an engineer and to back his racing which resulted in the now 1650 cc Ford-engined, red and white Diva winning countless races and the Redex Special GT Championship, John also winning the third Grovewood Award. Continuing with Willment support, John acquired a Lotus Elan 26R for 1966 and continued his winning ways. Probably his most outstanding result, which will live long in the memories of all who saw it, was the narrowest of victories at Brands Hatch after chasing down Bernard Unett’s Sunbeam Tiger Le Mans Coupe following a pit stop to remove a loose bonnet. By mid-season the mid-engined generation of GT cars, in particular the Chevron GTs, were spoiling John’s fun but he had done enough, including a run of nine successive race wins, to secure the Autosport Championship. His exploits with the Elan had caught the eye of Colin Chapman and he was invited to drive one of the mid-engined Lotus 47s. After winning at the then high profile Boxing Day Brands Hatch meeting in a Type 47, John was offered the chance to race a Lotus Components 47 and a Type 41 F3 car in 1967. John enjoyed numerous wins with both cars including a class win, sharing with another Lotus coming man Jackie Oliver, in the BOAC 500 World Sports Car Championship race at Brands Hatch, the little Lotus finishing ninth overall in a field full of factory Ferraris and Porsches plus assorted Ford GT40s. For 1968 John continued in F3 with the wedge-shaped Type 41X, winning more races in the seriously competitive category, whilst also racing the 47. The prospect of moving up to Formula 2 in 1969 was tarnished when Colin Chapman, having a high regard for John’s engineering abilities, gave him the unenviable task of developing the four wheel drive Lotus 63 F1 car. John started five F1 Grands Prix in this unloved device but only finished once and that was 10th and last in the British Grand Prix at Silverstone, nine laps behind after pit stops. John had the chance to drive in three Formula 2 races in a Winkelmann Racing Lotus Type 59B with a fine performance at Vallelunga in the Gran Premio di Roma, being classified third on aggregate after finishing second in the first part. After Graham Hill had sustained serious leg injuries in an accident in the US Grand Prix towards the end of 1969, raising doubts about his ability to continue in Formula 1, John was given the opportunity to drive alongside Jochen Rindt in 1970 in the revolutionary Lotus Type 72. Before Colin Chapman’s new brainchild was ready, John raced a Type 49C in the South African Grand Prix, finishing fifth, one place ahead of Graham Hill who had returned to racing after all, now in Rob Walker’s Type 49C. John never again finished in the points at World Championship level thanks to a string of retirements as he suffered the fate of so many number two drivers at Team Lotus. Jochen meanwhile had won five GPs and scored enough points to be crowned as 1970 World Champion posthumously after his fatal accident at Monza. John never drove for Lotus again. However, he was not quite finished with Formula 1. After the customary ‘tea at the Dorchester’ with BRM ‘s Louis Stanley, in 1971 John drove a P153 in the Brands Hatch Race of Champions, where he qualified a strong fifth and finished seventh after a pit stop, and the non-championship Jochen Rindt Trophy at Hockenheim where he qualified sixth but his ‘hand me down’ P153 expired after six laps. Also in 1971 John enjoyed a very successful season in a Chevron B19 with Denys Dobbie’s DART team, winning the RAC Sports Car Championship. There was little racing after 1971 and John’s last race came the following year at the invitation of his old Australian mate from the Team Lotus days, Brian ‘Yogi’ Muir to share the Wiggins Teape/Malcolm Gartlan Racing Capri RS2600 V6 in the Paul Ricard 6 Hours round of the European Touring Car Championship which they won ahead of the formidable pairing of Jackie Stewart and Francois Cevert in a similar car. After retiring from racing, John became an engine builder and then joined the staff of Autocar as a member of the road test team. He had a further involvement with Formula 1 and Team Lotus in the early ‘90s, the era of Mika Hakkinen, Johnny Herbert and Alex Zanardi, with responsibility for chassis set up. In total John spent 18 years with Lotus Engineering before moving on to Aston Martin where he helped to develop the DB7 GT, the Vanquish and the Vanquish S and ultimately he was with Multimatic, the motor sport components and systems supply company. In his spare time John returned to his roots, re-joined the 750 MC, and rebuilt an Austin 7. A great jazz enthusiast, in 1985 John founded Miles Music, a jazz recording company which, in 1996 released the CD Tamburello by Pete King, inspired by the death of Ayrton Senna, which won the BT Jazz CD of the Year Award. The BRDC extends its most sincere condolences to John’s wife Diane and family. John's funeral will be at 1.30pm on Friday 4 May at St Andrew's Church, Churchgate House, 5 Church Street, Hingham, Norwich NR9 4HL and Members are welcome. For those who would like to know more about the career of John Miles, Simon Taylor’s Out to Lunch is accessible on line at www.motorsportmagazine.com/archive/article/october-2014 and is well worth reading.